Did you celebrate an engagement at Christmas or New Year? Or maybe you’re a freshly engaged couple following a Valentine’s Day proposal? It doesn’t matter when you or your loved one popped the question, the fun starts here as it’s time to plan your dream wedding. Our exceptional wedding planners at Woodhall Manor know all about the hottest wedding trends, so here is their round up of the latest wedding trends for 2017. We’ve seen plenty of bubbly bars over the years, and ‘Pimp Your Prosecco’ trolleys featuring heavily in couple’s reception drinks offering. And let’s be honest, who doesn’t love a glass of fizz? However, there’s a new tipple trying to get in on the action. Gin! 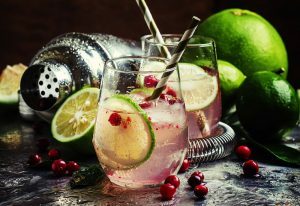 The hugely popular British tipple is incredibly fashionable right now, so why not embrace the trend by offering your guests customised gin cocktails or a DIY gin bar? We’ve even seen a wedding where guests were given Gin & Tonic lip balms as favours. Talk about the perfect excuse for some serious kissing action! As a nation, we can’t seem to get enough of baking. Maybe it coincides with the departure of the Great British Bake Off from the BBC, and maybe we all secretly fancy ourselves as Star Bakers, but whatever the reason, we love the new trend for dessert tables at weddings. 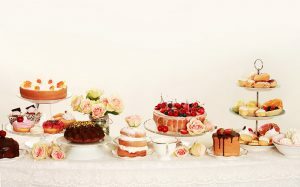 If you’re yet to experience this growing trend, it’s where guests are asked to bring a pudding or cake with them to the wedding celebration, and they are then displayed on a large buffet table to be enjoyed by all the guests after the main course. Guests can even vote for the best looking bake, and the winners are awarded a prize by the bride and groom. 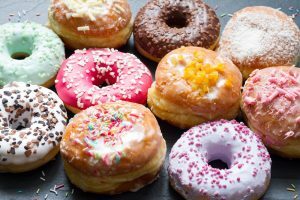 We’re not surprised that doughnuts are popping up at wedding receptions everywhere. The cupcake trend has been around for what feels like forever, and even macarons have been done to death… it’s definitely time for a new sweet treat to take centre stage. You can customise doughnuts with different glazes and filling, they make great favours, and can even by stacked like a croquembouche to create an alternative wedding cake. We’re sold! Having a lasting memory of your wedding day is essential and as well as the formal photography, many couples love to arrange photo booths with stacks of props to get your guests creating funny visual reminders of your big day. However, we’re seeing a growing trend for an even more personal option – the hiring of a portrait artist or illustrator who can capture your day with sketches that can be given to guests as a memento, or used to create an alternative picture album for the newly married couple. Our considerate couples are often looking at ways to think of others, and respect and protect the environment in any way they can when planning their wedding celebrations. Wedding days can be seen as a day of indulgence and excess, so it’s wonderful if you can think of ways to respect the world around us and give something back. There are lots of ways to make a difference, however small, so why not think about printing your invitations on recycled paper with environmentally friendly inks, or look to source local food and home grown flowers. Once your big day is over, you could take your wedding flowers to a local hospice or care home to brighten the lives of others less fortunate. And if you really want to support a cause you feel strongly about, ask friends and families to make a donation to a charity of your choice instead of creating a wedding gift list. To learn more about the latest trends for memorable weddings, give our knowledgeable wedding planners a call today. Why not arrange a private tour of our stunning country Manor house while you’re at it? Give us a call on 01394 411 288 to find out more about Woodhall Manor.